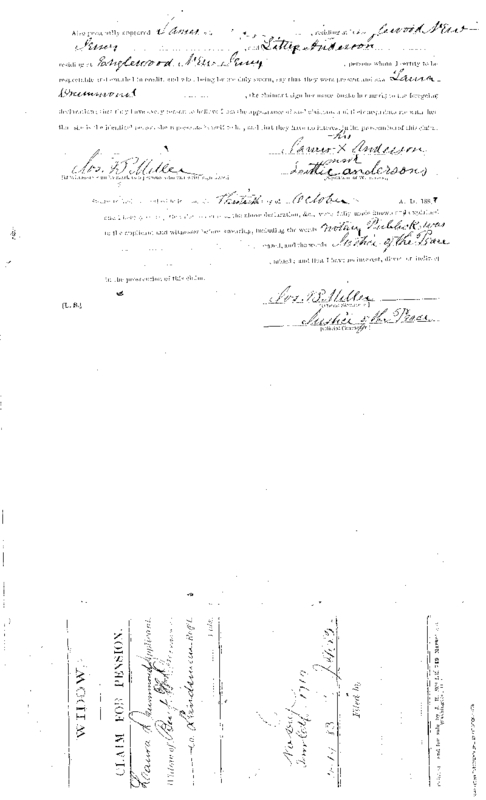 Laura Drummond filed this "Widow's Declaration for Pension or Increase of Pension" on October 30, 1883. In it she states that her maiden name was Laura Berkely, and had married Benjamin Drummond on April 15, 1860 in Richmond, Virginia. She also states that they had a son, named Benjamin W. Drummond, born May 14, 1876, who was at the time of the filing of this Declaration "Under the personal care of relatives, Funds for maintenance furnished by applicant." Laura Drummond also states that she had previously filed claims on March 19, 1883 and in April, 1883. This is a digital copy of the original record held by the National Archives.Click here to see the other side of this Declaration.